The average American spends more than 15 hours consuming media every day from dozens of different sources. How much more can we consume? In short: Our culture has reached media over-saturation. And it’s affecting the way we consume and appreciate content. Studies show that more options actually make us less satisfied. Researchers have found those who compare and deliberate on their choices more frequently experienced much higher levels of unhappiness — even depression. According to a new Bridge Ratings consumer study, digital media burnout has reached a tipping point. Trends suggest massive time-spent increases with digital media platforms over the last few years have created decision-stress among most Americans. As typical Americans expand their use of digital media to the point of saturation: 12 hours each day, usage of some platforms will diminish. We're finding that generally only three of the most-consumed digital platforms for most individuals will manage to sustain current usage levels and by the end of 2018 we will see declines in time-spent with those that don't make the cut. What does this mean for media companies? As much as increased digital usage over the last ten years has created competitive headaches for legacy media such as television, print and radio, heightened competition for attention has arrived which further complicates matters. While in Las Vegas for the Consumer Electronics Show this year, once again Bridge Ratings conducted focus groups to learn more about consumers time spent with digital media platforms. Added to our on-line research study of 2500 persons ages 13 and older which we conducted January 2 through 12, it is becoming clear that consumers are struggling with all the media available to them. The team at Bridge Ratings has been trending digital consumption for over ten years and with each new year we have seen increases in total time spent with digital platforms which include on-line music streaming, on-line video streaming, social media, texting and more. It has been exhilarating to see how much time is devoted to the world of digital entertainment. We have just completed our January interviews related to digital platform preferences and the results point to the first look we have had regarding consumer prioritization of digital media content. Teens have always been early adopters of all things new and digital entertainment has been no different. What we're seeing from them in this study we conducted in January 2017 and again January 2-10, 2018 may be a harbinger of movement across all demographics. Digital Attention Deficit - when the amount of potential digital platform use exceeds traditional daily time available. We asked our panels to prioritize the digital platforms they use on a weekly basis. For teens, Social Media, Gaming and On-line Video streaming reign supreme. How to read: Digital entertainment platform preferences January 2018 v January 2017. For teens, Gaming was the #1 most-utilized platform in 2017. in 2018 it is second. For teens increased time-spent with on-line video streaming, TV on-demand and social media consume 75% of their weekly digital engagement. Reduction in Time spent is with Podcasts and texting. Millennials and adults 25-54 share similar consumption preferences when it comes to on-line streaming whether it be video or audio. As the above chart reflects young adults intend to spend more time this year with on-line video streaming likely at the expense of texting and podcast consumption. The Adults 25-54 years of age in our panels indicate more time spent this year with on-demand streaming - both audio and video with less spent with social media and podcasts among others. Adults 55+ and Boomers actually see themselves spending more time with social media and on-demand Television. Podcasts continue to interest this demographic and is the only one of these four age groups where podcasting retains a high degree of time spent consuming. And while podcasting is among those activities that may experience reduced usage this year among all consumers, primary users of the platform will likely continue to consume their favorite podcasts more frequently at the expense of expanding their list of downloadable podcast content. At the heart of the increasing media fatigue is social media. Though social media use remains high, a significant portion of our sample self-reports that they are not enjoying their time spent on it as much as they used to. Daily social media usage has fallen from 70% to 63% over the last year. The most pronounced drop has been among ‘leading millennials', ‘the social media pioneers', among whom daily use of social media has fallen to 72%, from 84% last year. A decline in heavy users – defined as those that update or check their accounts more than 10 times a day – has apparently driven this overall decline. A third of our panelists have temporarily or permanently deactivated one or more of their social media accounts in the past year. 55% have unfriended or unfollowed friends on their platforms who have posted negatively. One in five ( 20%) Americans reportedly don't enjoy their time spent on social media, and 46% report spending more time on it than they would like. While the increase in influence of social media is undeniable, the social reality is that, this year, survey respondents are showing signs of dissatisfaction. With social media feeding the fatigue factor among both our focus groups and on-line questionnaire participants and with a limited amount of time available each day for media consumption, there is evidence that consumers are being forced into making difficult decisions about the full array of media consumed during a typical day. When given a choice consumers in our sample are choosing Entertainment-based platforms such as on-demand audio and video or gaming to capture what time they do have. Accentuating these types of platforms results in reduction of others as we see in the above study results comparing 2018 with 2017 digital media consumption. With increasing sources of entertainment and greater consumer prioritizing, media companies in 2018 are faced with a new facet to competition: how compelling is your content? The long tail of on-demand digital entertainment has become overwhelming for many so they have become more critical in the way they spend time. Consumer choice related to most-used digital media platforms today is shifting more to entertainment than to information. This study confirms changes in behavior which should guide digital media content producers for the immediate future and provide a strategy for traditional (TV, radio, print) media to further engage audiences by offering exclusive - not reconditioned - content on-line. Sources: 8 in-person and on-line focus groups of 10 digital media consumers each conducted during the week of January 8, 2018 by Bridge Ratings Media Research. 2500 on-line interviews via questionnaire with persons 13-70 years of age Janurary 2-12, 2018. A previous article about social media use was published last year. Andrew Watts, a 21-year-old college student, has written a follow-up. On January 2, 2015, I wrote a viral post entitled “A Teenager’s View on Social Media,” in which I dissected popular apps and what I thought about them. It got over one million views. Many people have asked me to write a follow-up or, at the very least, an update. I haven’t felt there was a dramatic enough shift to warrant a new post, until now. I will start this post off with transparency, since it influences my view of the landscape. I am a 21-year-old male attending The University of Texas at Austin. I am heavily invested in social media and I try out all of the latest social apps whenever I can. I really love following and paying attention to the trends surrounding social media, often observing both my own and my network’s usage of it. I have previously interned at Facebook and Google, but the views in this post are my own and any commentary about product feature requests or these companies’ product roadmaps are purely speculative. No hot scoops here. Similar to the previous post, I will break this down by network and what I’ve observed over the past two years. Users are better educated on how to tag people in the comments of posts and how to share posts, which has helped viral content spread. The emphasis on videos over text has made the platform more engaging and shareable, since videos are (currently) one of the most engaging formats. The emergence of “Weird Facebook” — Facebook pages and groups that are focused on memes or other niche topics. Messenger has also become a valuable tool. I know plenty of people who prefer Messenger to traditional texting. It’s the communication platform of choice when I (as an iPhone owner) have to message an Android user. Facebook Live has also become increasingly influential among my peers. I know at least a dozen friends who have gone Live in the past month. For now the feature still seems fairly niche, with a ton of barriers to user participation (people often don’t have enough content for a continued stream, so they shut it down within a minute or two). Also, the fact that going Live (seemingly) notifies your entire Friend List can make for a pretty stressful process with a lot of pressure. But for my friends and me, Facebook is still not the dominant social network many people see it as. If people meet at a party, they’re more likely to add each other on Snapchat or Instagram. That isn’t to say people don’t friend one another on Facebook anymore — they definitely do — but rather that other networks dominate the conversation. Facebook is seen as a fairly formal means of connecting. If a friend of mine meets a guy at a party, she doesn’t want him to see all of this information about her that’s on Facebook. She prefers Snapchat because it opens a line of communication, gives a more honest look into a person’s life, and is just more lightweight as a platform to talk on. I’m not terrified if I like something on Instagram that it will show up in someone’s feed (though, I’m not really as worried about that on Facebook as I used to be). There isn’t pressure to follow back on Instagram, making the content inherently more curated. The content on Instagram itself is generally higher quality. Instagram still (which is honestly surprising) hasn’t been flooded with the older generation yet. People often don’t post as much content on Instagram but, with the new algorithm (which I’ll get to shortly), even if they did it wouldn’t matter as much. The one thing that has changed is my stance on links on Instagram. I believe links should be added to Instagram, given that the release of their new algorithm would prevent link spamming, and given that the integration Instagram did for links on Stories (having users simply swipe up from a Story in order to visit a link) was brilliant. Speaking of Instagram Stories, I’m actually a huge fan of this feature. I don’t have too many friends who post on it, causing it to mostly be populated by celebrities or brands. However, the organization and implementation of Stories is genius, making me want to engage with it anyways. Their unobtrusive spot at the top of the feed, sorted based on the engagement you’ve had with the Instagram accounts, and the navigation of the Stories themselves is brilliant. Plus, tagging friends in the posts on Stories and adding links have both been integrated terrifically. The content on the Stories often mimics what users see in the feed — highly curated, often artistic photos. That being said, you won’t see the sort of raw view into someone’s life on Instagram as you would on Snapchat. Snapchat is still a much more personal network and is the only place where I feel like I can be myself when I post. But I’ll get to Snapchat later. Instagram’s Direct Messaging has also improved dramatically, mainly because of the addition of the share button on posts and the (seemingly forced) inclusion of comment tags → DMs. Whenever you tag a friend in the comments on Instagram, it defaults to sending them a message of the image, rather than leaving an actual comment with the tag. I don’t have conversations with anyone over Instagram DM, mainly just sharing photos back and forth on the platform, which I think is the perfect use case for it. My views regarding Instagram’s Live functionality are the same as my views on Facebook’s, though I would feel more comfortable using Instagram’s because it deletes automatically. Harassment, spamming (just go to any political person’s Twitter), and lack of a transparent review process (at least compared to other sites, such as Facebook). Difficulty with curation compared to other networks. It’s hard to find Twitter accounts I may like, since “People to Follow” generally seems pretty random for me (or it’s just simply accounts I’ve recently viewed). The blatant stealing of content from accounts such as Dory, Common White Girl, and more discourages content creators from publishing on the platform. Tweets are often shared on other social media platforms (such as Instagram), so many people just follow Instagram aggregator accounts that steal content instead of finding it on Twitter. I wonder if there’s a way for Twitter to prevent this in the future or, on the other hand, embrace the fact that this is occurring and find a way to lead people back to their platform. Snapchat has grown tremendously in the past two years. In my 2015 post I called Snapchat addictive and liberating, mostly for the way its design swept away social pressure. By now, everyone I know has a Snapchat account and almost all of them use it on a regular basis. It has become an essential app not only for posting and sharing photos, but for messages as well. The Chat functionality of Snapchat has improved tremendously and I have at least a couple conversations a day on it. Snapchat definitely helped spur its growth by having a “swipe up to reply” functionality for Stories, which I use daily and which makes it easy to start conversations on the platform. What I love so much about Snapchat is that the product embraces being fun. People are their authentic selves when they post on Snapchat, using funny filters, lenses, stickers, or inserting their own Bitmoji into Snaps (which is fantastic by the way—a perfect acquisition for Snapchat to make. Everyone I know uses Bitmoji regularly). I also think Snapchat’s stickers are the best stickers in the game right now, and their search functionality for stickers is always on point. When someone finds a new lens and tries it, you can see the network effect throughout your feed and see everyone else giving it a shot as well, even if the lens isn’t the most flattering. Snapchat allows you to have fun and be yourself in a way no other social network can right now, especially with the absence of most of the external social pressure of other networks, where you worry about how many likes you’ve collected. Even so, lately I’ve been running into some issues with Snapchat. Because everyone I know uses it, there’s often too much happening, especially with Stories. Snapchat has implemented a few product features to try to combat this, but it still seems pretty tedious to go through my entire feed to find specific friends whose Stories I want to see. Snapchat should take a cue from Instagram (since Instagram took so many cues from Snapchat) and organize their Stories based on engagement/interaction from the user. As of now, my feed honestly kind of stresses me out. I also wish you could hide Stories from friends—for some people who post a lot, I don’t necessarily want to see their Stories, but I still want them to be able to message me (and vice-versa). Tumblr — It’s really hard to gauge how relevant Tumblr is since it often isn’t discussed. It seems like to many, the appeal of Tumblr is to have a personal account away from everything else where you can post and share with total strangers (who are generally interested in the same things you are). People don’t often go around advertising their Tumblr accounts or, if they do, they have a public account AND a separate, more personal account for what I just mentioned. I think Tumblr could do a better job of making itself more social and shareable (so people talked about it more), but I also think the closed platform is part of the appeal. Kik — Very popular messaging application with the younger crowd (13–18). Family members who are still in high school tell me they use it all the time. The bots that exist on Kik are well made, and its developer environment and bot store make it one of the most approachable bot applications for developers and users alike. WhatsApp — Although I do not personally use it all that much, WhatsApp is a force to be reckoned with abroad and is definitely not going away anytime soon. GroupMe — Still by far the most used group messaging application in college, although iMessage may eventually take this title away, especially as more people switch to the iPhone. GroupMe has had a few improvements over the years, but I think there’s much more potential for this application than the developers are currently utilizing. YouTube — Really the only place anyone watches videos aside from Facebook. There has been some drama between YouTube and its creators over the past year, and I think YouTube could possibly improve on how it communicates with its creators, given that many have complained about being caught off guard with major changes to the site. This section is for social networks that have essentially gone away and are completely off the radar for both myself and my peers. This isn’t to say that the networks themselves are bad or anything, just that no one I know ever uses them. Like…ever. I was most surprised to see Vine and Yik Yak fall. As a user of Vine, I could tell the content on the app was becoming stale and people were moving to other platforms. However, I felt a better integration with Twitter could have saved it. Even though the app will become a “Vine Camera,” Twitter could have done more to engage with influencers on the platform and connect it more to the main Twitter app. Yik Yak is different from others on the list because many students in college not only have heard of it, but have even tried it for themselves. 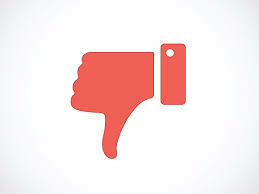 However, the lack of continued engagement as well as bullying and harassment sadly proved to be detrimental to the app. Musical.ly / Live.ly — Musical.ly is a social network where users post lip-syncing videos to everything from music to Vines. Live.ly is a livestreaming application made by Musical.ly. Musical.ly became popular just a few months after my first blog and has taken the social media world by storm. My family members who are still in middle school tell me about how everyone they know is on Musical.ly and how they use Live.ly to keep up with their favorite celebrities, albeit middle school celebrities (what’s up, Jacob Sartorius). Musical.ly has a really smooth interface and a thriving community — it’s definitely one to watch. Houseparty — A video chat application from the minds behind Meerkat. I’ve seen more and more people at my university use Houseparty as a way to hang out and chat with their friends. I have even overheard people talking in class about being on the application, which is generally a really strong sign, especially when the application has done very little traditional campus marketing (which I am a huge fan of staying away from). Curious Cat — Think of Curious Cat as a more social, next generation version of Ask.fm. It’s a popular Q&A social network, focusing more on personal questions rather than the more general ones that Quora or Yahoo Answers address. Curious Cat has mainly been spreading through Twitter, yet I could see the site becoming more influential if they nail down how to handle harassment on the platform (which is not an easy feat). Discord — Discord is a chat application focused on gamers. It has myriad features that help serve its over 300 million users every day. This chat app is highly influential in the gaming sphere and will likely extend beyond that market very soon. Social media has changed dramatically over the past two years. A perfect example of this is how Live video emerged at the forefront of companies’ product strategies. I don’t think there will ever be “one network to rule them all.” Every network has its own merits. So if I were to offer one piece of advice, let it be this: social networks should stop trying to make one app that does everything. Instead, they should strategically focus on the communities or needs that aren’t already being served by other networks. For music programmers who have been utilizing on-demand streaming data to properly align their on-air music with true music consumption, here's some news: Playlisting has become the dominant way most music fans listen. 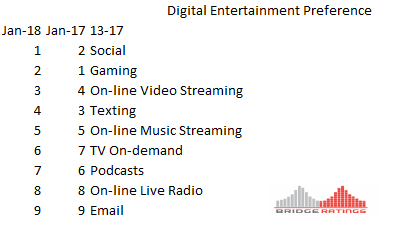 At Bridge Ratings we have been tracking music consumption through on-demand streaming services for over four years. We now share this data with our music radio clients seeking to properly align their on-air song exposure to their listeners' actual consumption. In a typical year we process and analyze hundreds of millions of streams from across the U.S. and, more specifically, by market and station. Over the past three years we have undertaken an analysis of music streaming consumption and learned almost immediately in the fall of 2015 that playlisting plays a significant role in the way the average person consumes music through on-demand streaming platforms. Playlist is a term to describe a list of video or audio files that can be played back on a media player sequentially or in random order. In its most general form, an audioplaylist is simply a list of songs, but sometimes a loop. Read the full article in the Navigate the Future Blog.